With the 2017 National Defense Authorization Act (NDAA) coming up for a vote in Congress as soon as next month, now is a good time to revisit the history of the 2012 NDAA’s indefinite detention powers, and based on that history, why Congress should seriously think about repealing them. The authority underpinning the detention provisions of the 2012 NDAA is in the claim that the laws of war can be applied to American citizens in the United States. It is crucial, therefore, to any true understanding of these provisions that we revisit the two times the laws of war were applied to American citizens in our past, and then retrace how the War on Terror has brought the laws of war to bear on American citizens again. The first use of the laws of war against American citizens was during the U.S. Civil War. Shortly after the outset of the war, President Abraham Lincoln issued Proclamation 94[i]. This order suspended habeas corpus, the legal requirement that the government must present a reason for someone’s detention or incarceration, and also subjected to martial law “all persons discouraging volunteer enlistments, resisting militia draft or guilty of any disloyal practice affording aid and comfort to rebels against the authority of the United States”[ii]. Under the authority of this proclamation, the Union military detained approximately 13,000 supposed Southern sympathizers[iii]. One of those detained, Lambdin P. Milligan, was a lawyer who was heavily critical of Lincoln’s war efforts. He was sentenced to hang by a military tribunal. His sentence was later commuted to life imprisonment by President Andrew Johnson. When the courts are open, the Supreme Court wrote, no civilian can Constitutionally be tried under the laws of war. The U.S. government later apologized for this gross violation of individual civil liberties, and authorized the payment of reparations to internment survivors, when President Ronald Reagan signed the Civil Liberties Act of 1988. After the events of September 11th, 2001, the opportunity arose again for the Executive Branch to place Americans under the laws of war. The tool, this time, was passed by Congress. The 2001 Authorization for Use of Military Force (AUMF) was passed by Congress with the explicit purpose of enabling US forces to track down Al-Qaeda and Taliban leadership in Afghanistan. It is only two pages, and was supported by nearly every member of Congress 13 days after the September attacks. While the authority granted to the Bush administration was sweeping in that the president alone could now determine, without a court hearing, who was involved in the attacks of September 11th, it was specifically targeted at those who had committed a crime (the 9-11 attacks). , and as a military authorization, it only applied to non-citizens outside the United States. The administration however, was unsatisfied with these Constitutional limitations, and sought for a place to expand beyond them. A few years later they would get their chance. Yaser Esam Hamdi was born an American citizen in Louisiana in 1980, and moved to Saudi Arabia as a child. By 2001 he resided in Afghanistan. He was captured by coalition forces in Afghanistan, detained on “little more than the government’s ‘say-so’[viii]“, interrogated, and eventually sent to the military prison at Guantanamo Bay. His father challenged his detention, and the case went up to the Supreme Court. In front of the Court, the Bush administration made two key arguments. One, that the president had the Constitutional authority under Article II to detain Hamdi without trial. And two, that even if that wasn’t true, the 2001 AUMF authorized the president to detain Hamdi without trial, regardless of his status as an American citizen. It let the president’s claim that he had the plenary authority to detain any American citizen, anywhere in the world except the United States, go unchallenged. It allowed the administration to remove any citizenship restrictions on the 2001 AUMF, leaving only two protections keeping any American citizen from being detained without trial, tortured, or otherwise dealt with as an enemy combatant by the Bush administration: connection to the September 11th attacks and the borders of the United States. On the same day at the decision of the Supreme Court in Hamdi v. Rumsfeld, the Court also released its opinion in Padilla v. Rumsfeld, removing the second of those two protections. Jose Padilla was an American citizen living in Pakistan. When he flew to the United States, he was detained in Chicago’s O’Hare airport on accusations of providing support to the Taliban. He appealed his detention without trial on the basis of his citizenship and being detained on US soil. In that case, the Bush administration argued it could detain U.S. citizens, on American soil, without charges or a trial under the 2001 AUMF. The Court decided to focus on the habeas petition and not to consider the question of whether or not the president could order the detention of an American citizen on U.S. soil. U.S. citizens were no longer protected from indefinite detention without trial inside the United States. The logical extension of this law of war authority occurred on September 30th, 2011, when Anwar-Al-Awlaki, an American citizen, was extrajudicially executed via drone strike in Yemen[ix]. His son, 16-year old Abduhlrahman Al-Awlaki, was executed via drone strike two weeks later. In the memo justifying the drone strike on Anwar that was leaked to the press two years later, the 2001 Authorization for Use of Military Force is cited as the authority for the assassination[x]. The justification for killing Al-Awlaki’s son has never been released. Now that the Bush and Obama administrations had detained US citizens on US soil without charge or trial, and executed American citizens abroad, there was just one protection left for U.S. citizens. You still had to be connected to the attacks of September 11th, 2001. The 2012 National Defense Authorization Act, Section 1021, removed that last protection. The National Defense Authorization Act, itself, is typically a bill that authorizes funding for the military. It has had various controversial provisions in the past, such as the creation of a program to transfer used military equipment to local police departments under the 1998 NDAA[xi], it is primarily a defense spending bill that has been passed every year for years. The fact that it is a yearly spending bill, and authorizes funding for American troops making it a difficult bill to vote against, made it the perfect legislation in which to slip two provisions that remove the last set of protections against indefinite detention of American citizens without trial. 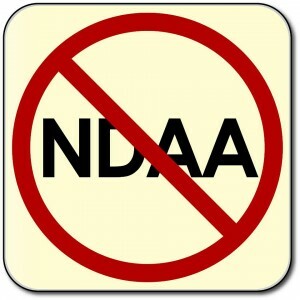 The 2012 NDAA started out as Senate Bill 1867. Sections 1031 and 1032 (which would later become Sections 1021 and 1022) were inserted during the initial Armed Services Committee deliberation on the bill. At the time, the provisions as introduced by Senators John McCain and Carl Levin supposedly excluded American citizens. The Obama administration threatened to veto the bill because it interfered with its “flexibility” to fight terrorism[xii]. During the Senate debate on these provisions, Senator Rand Paul (R-KY) noted the ease with which any American could get caught in the 2012 NDAA’s net. Senator Paul referenced Federal Bureau of Investigation (FBI) documents that claim “missing fingers on a hand,” having “7 days worth of food supplies,” “multiple guns in the home”, and having a “strange odor” were indicators of terrorism. Senator Paul was right to point out the extremely broad and arbitrary nature of the government’s definition of terrorism and “support” of terrorism. Government documents uncovered before and since have defined the Tea Party movement, supporters of various presidential candidates, and Department of Homeland Security-funded studies that define those who are “reverent of individual liberty” and suspicious of centralized federal authority” as potential terrorists[xiv]. With the addition of one simple paragraph, the Senate removed the last vestiges of judicial process from American law, and overnight, put forth the legislation necessary to turn America into a legal battlefield in the war on terror. Before the 2012 NDAA, the only thing preventing the President from ordering an indefinite detention of an American citizen was the requirement that the citizen be tied to a past act of terror. The new requirements include nothing of the sort. There is no requirement for court review, judicial process, or requirement that the government present evidence that a citizen was involved in terrorism. Even if there were, the government, when challenged in open court in Hedges v. Obama, refused to define what would be considered terrorism under the 2012 NDAA. Now, if the president, or someone he designates, merely alleges, without proof, that anyone has “substantially supported” or “directly supported” “associated forces” or commits a “belligerent act” in this “support” that person can be disposed under the laws of war. Since enhanced interrogation and extrajudicial execution have already been used in precedent, add them to that list. The 2012 NDAA passed the U.S. Senate 93-7 and the U.S. House of Representatives 283-136. It was signed into law on New Year’s Eve 2011 by President Barack Obama, from his vacation house in Hawaii, while Americans poured another round of drinks. Reinforcing the Obama’s administration’s intent to use the 2012 NDAA on potentially innocent Americans, a few things have happened since the 2012 NDAA was signed. First, when District Judge Katherine B. Forrest asked the government if it was currently using the 2012 NDAA’s detention provisions, it refused to answer. Two, when Judge Forrest issued her permanent injunction against the detention provisions, the government applied for, and received, an emergency stay from the Appeals Court. You don’t apply for an emergency stay unless you are currently using the provisions. Third, in a March 4th, 2013 letter to Senator Rand Paul, Attorney General Eric Holder admitted that it would be possible for the President to “authorize the military to use lethal force within the territory of the United States. [xvi]” This is the very authority the 2001 AUMF has been interpreted to grant, and the for which the 2012 NDAA removes all judicial process requirements. We are not aware, at this point, of any use of the 2012 NDAA currently against an American citizen. But because the law allows for no charges, no trial, and indefinite detention, we will probably never know. An American citizen can be simply disappeared, or as Attorney General Eric Holder put it, killed, without any charge or a trial in America. That’s not the America I was brought up to believe in. And I fear if we don’t do something about it, we will have lost everything that made this country exceptional in the first place.